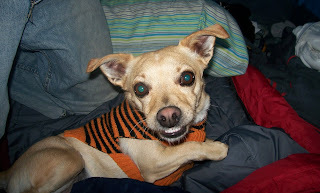 Bosa loved camping, although it was funny to see what he thought of the different experiences. When I went to give him his food, he buried some of it first (maybe thinking it was his last meal), and when it got dark he had to sit in your lap, there were no other options. It was a bit nippy out so we put a sweater on him, but he loves those anyway. 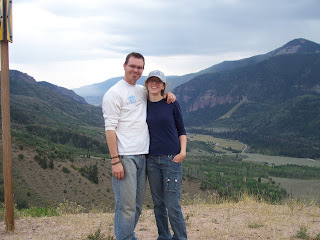 We had a great time making tinfoil dinners, sleeping outdoors, and taking a big hike the next day. Bosa was ecstatic to go on a hike, it was like the eternal walk he's always dreamed of, even though it was somewhere around 6-7 miles. 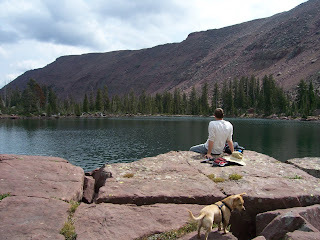 We hiked up to a series of lakes and it was really beautiful, and Bosa learned that water might not be so scary as he wandered in a few of them wanting to get to Mike on the other side. After we went camping, we stayed with Mike's parents on actual Labor day. We went golfing, well, my mom-in-law and I rode along with Mike and his dad while they golfed, and then we went up another 6-7 mile hike in Bountiful, the view was stunning and we had lots of fun with Mike's parents and his cousin, Cadence, that went with us. 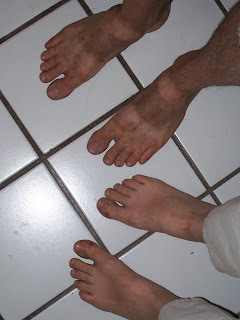 This picture is the result of hiking in our Teva's (hiking sandals) - I thought it was funny. Risa called Mike: "Hi Honey, I think I would like a kitten." Mike: "Okay, let's get one." And he did. Not too bad of a husband there, eh? 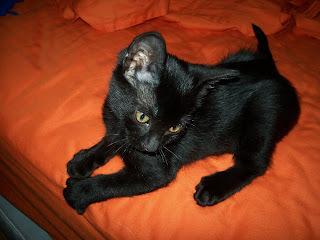 He's so awesome, I sent him tons of online adds for free kittens, and then he picked one up on his way home from work. Our little furball is tiny and sweet, and very, very loud. He yells at us all of the time, even when he is purring and we are lavishing attention on him. We think we are going to name him Captain Edward Teach after Blackbeard the Pirate, as Edward Teach was one of his "real" names (one that he went by anyway). Needless to say, Inca is royally peeved, so the intro process is going slow, but we hope that she can grow to tolerate him as well as she tolerates Bosa. Bosa is very jealous, but he's doing very well now and likes to play with Teach sometimes. I took some film of his protests the first night we had the cat.